A spike in consumer confidence is lifting the markets today. Blue-chip stocks are headed higher this afternoon on the heels of better-than-expected news about consumer confidence. With roughly an hour left in the trading session, the Dow Jones Industrial Average (INDEX: ^DJI) is up by 106 points, or 0.69%. Results from the University of Michigan/Thomson Reuters index of consumer sentiment released today suggest that Americans are feeling better about things than they have in almost six years. The preliminary reading for the month of May came in at 83.7, well ahead of the previous month's 76.4. Assuming the results aren't subsequently revised, this marks the highest level since July of 2007. Economists surveyed by MarketWatch had expected a reading of 77.5. Multiple sources are attributing this news to the ongoing rally in stocks. As an analyst quoted by The Wall Street Journal noted, "The consumer-confidence data is what is really pushing the market today. Ultimately we need to get the consumer to be more of a factor in the economy." In terms of individual stocks, Boeing (NYSE: BA) is among the Dow's leaders today, up by 2.3% at the time of writing. A press release issued by data analytics firm FactSet showed that the aerospace company was the "favorite allocation" of the 50 largest hedge funds in the first quarter of the year. According to the firm's analysis of 13F filings, "The stock experienced $1.6 billion in inflows, which amounted to nearly 250% of its Q4 value in the funds' aggregate portfolio." This interest goes a long way toward explaining the performance of Boeing's stock this year despite the company's recently resolved issues with its flagship 787 Dreamliner. 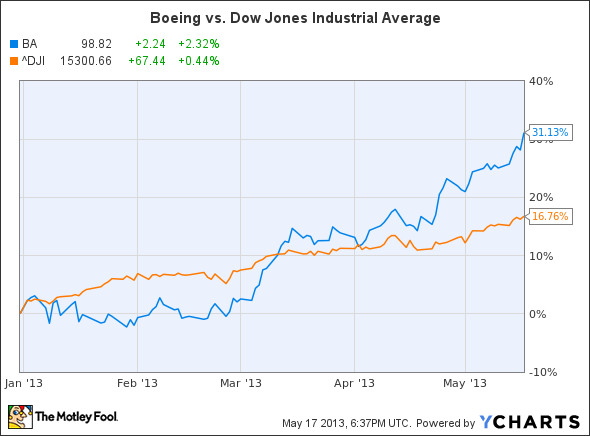 For the year, shares of Boeing are higher by 31% compared to the Dow's 18%. Heading lower, alternatively, are shares of Merck (NYSE: MRK), which are off by 1%. This move is also likely related to the proclivities of institutional investors. As my colleague Matt Thalman noted earlier, famed hedge-fund manager Stanley Druckenmiller liquidated the entirely of his position in the pharmaceutical company sometime during the first quarter, according to the 13F that reveals his holdings. Prior to that, it had been one of Druckenmiller's top holdings.